"He was a big baseball guy. He made the varsity team as a freshman,” said Ricky Teal's brother. CLEARWATER, Fla. — Ricky Teal's senior year baseball jersey hangs in his brother's home. The Clearwater High School athlete died in a 2002 car wreck. "He was a big baseball guy. He made the varsity team as a freshman,” said his brother. The community rallied around Teal's family shortly after his death, raising thousands of dollars to build batting cages and a memorial in his honor. "The defacing of the picture is probably somebody who didn't know him,” said Teal. 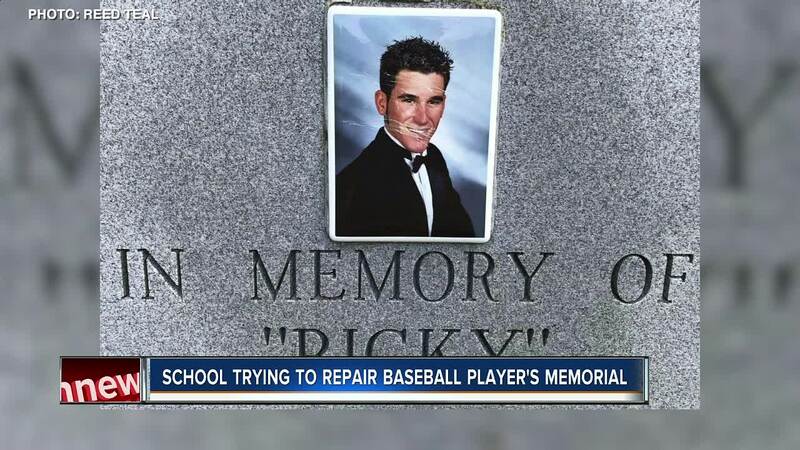 Recently Clearwater High’s head baseball coach noticed the memorial could use a lot of love. "We're just looking to first get it back to the look that it was, restore everything that we can. And then to add on and make it even better,” said Head Baseball Coach Jordan Banks. Now the team, the school and teal's family are raising funds to refurbish the batting cages and replace the scratched photo of Number 9. "The nets have some holes in them. Paint. Light fixtures,” said Reed Teal. His brother's jersey hangs in his home but this memorial is for everyone who loves Tornadoes Baseball. It’s also for the kid who never got to finish his senior season. "He would have been super proud to have his name on this thing and I think we need to show how proud he would be by keeping it shining the way he would want it to,” said Ricky’s brother.